Children from 4th, 5th and 6th classes were accompanied by Miss Leavy and Ms. Gavigan to compete in Athletics in Moyne Community School earlier this month. A great day was had by all. Congratulations to the Stonepark boys basketball team and their coach Mr. Barry O’ Connor, who defeated Colehill N.S. in the Division 1 Final in the Mall on Sunday 18th March 2018. Stonepark N.S. Mixed Spikeball and Boys’ Spikeball teams competed in the All- Ireland Spikeball competition in Mary Immaculate College of Education in Limerick on 22nd March. Our mixed team lost the Semi Final to a Limerick team and our boys’ team lost the Semi Final to a Cork team, who in turn went on to win the Boys competition. Both teams and their coach Mr. Leen trained very hard this term to reach this advanced stage in the competition. Congrats all. 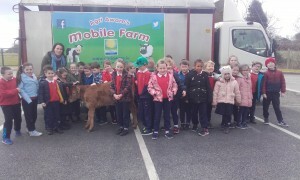 Thanks to Stonepark Parents Association for organising the Agri-Aware farm visit to the school on 22nd March. 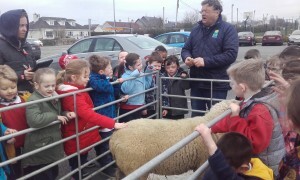 Farmer Pat from Tipperary talked to the children about the animals and introduced them to his sheepdog Gwen. The children saw sheep, pigs, a calf, chickens and ducks. It was such an enjoyable experience for the children. Our talented 4th class competed in the Leinster final in the Cumann Scoildrámaíochta in Mullingar on 21st March. We await results from this competition. French Visitors from Noyal-Châtillon-sur-Seiche in Brittany visited the school on Friday 16th March. 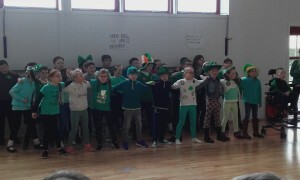 They were entertained with a selection of Irish music, song and dance by students from second and third classes. The students from first class interviewed our visitors and ask them questions about their school day in France. They also sang “Molly Malone”. 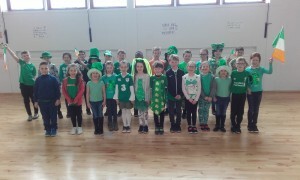 It gave the children a real opportunity to celebrate being Irish on Lá Glas. Second class celebrated the Sacrament of Reconciliation in Curry Church recently. First Communion is on 26th May @ 2pm. Confirmation will be on the 12th May @ 11am. Representatives from the RSA visited the school to talk to the children about road safety. Their aim was to raise awareness and increase understanding of road safety issues among school children in Stonepark N.S. All the children in the school got an opportunity to plant an acorn with John Crossan during National Tree Week 2018. Thanks to Providers Longford for sponsoring the compost and to Jenny White, Florist, Ballymahon for sponsoring the pots. Longford County Council sponsored a “Leave No Trace” Workshop for 5th class students. Sixth class Students went on a heritage walk along the River Camlin with Mr. Eamonn Brennan and then went out to Clondra to see where the River Camlin meets the River Shannon on Friday 16th March 2018.